The World Health Organisation says lifestyle diseases are now the leading causes of death around the world. Bad diets and unhealthy lifestyles have become the biggest threat to life expectancy, fuelling seven in 10 deaths, a major Lancet study also found. Nigeria’s case may seem even worse, considering the decreasing life expectancy to 52.2 years, when life expectancy in other countries’ is on the increase. MITUN DADA is the founder of Eat to Live Lifestyle, a one-stop-shop for healthy living. 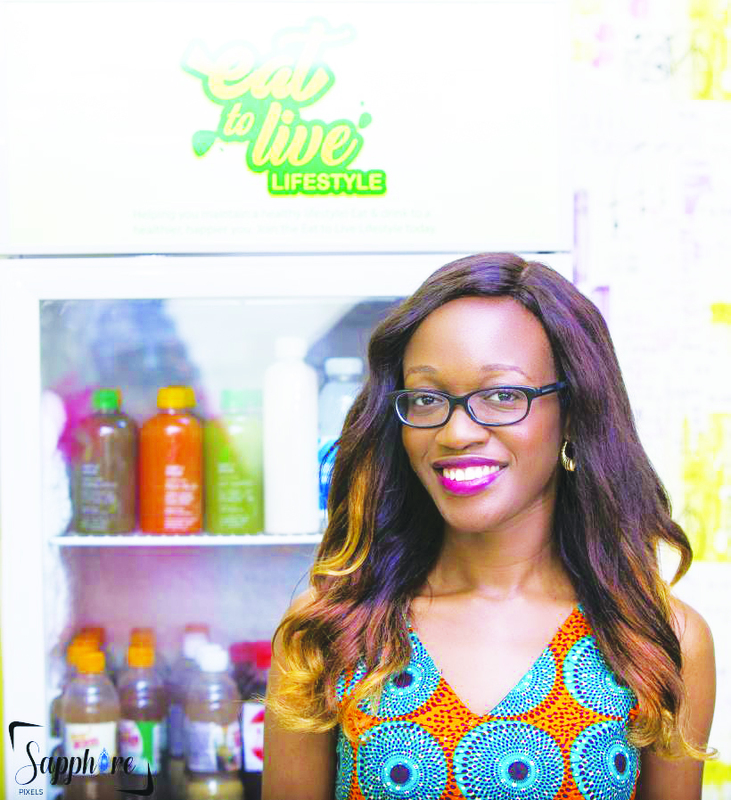 In this interview with NSE ANTHONY-UKO in Abuja, she sheds light on her activities to promote healthy lifestyle habits in not just what people eat, but also in what they think and do, in order to encourage Nigerians, and indeed Africans, to live healthier and happier lives. What was your motivation for starting Eat to Live Lifestyle and not the conventional restaurants? There were two major motivations. When I first moved back to Nigeria in 2008 I realised that there weren’t a lot of places where you could get healthy foods. When l finally saw one person online selling smoothies and salads, one foot to the address, I realised it was somebody’s house. Also, I always had to send a friend traveling abroad to help me get most of the healthy organic ingredients I needed to make my smoothies or drinks. So, I thought it would be good to have a place where people could readily go to get everything they needed to maintain a healthier lifestyle. So that was one motivation. Secondly, a few years ago, my mother was diagnosed with cancer. Unfortunately she passed away from that. As a household we had to change how we eat. She couldn’t eat much of the things we were eating because a lot of the things that we eat actually feeds cancer cells or cause cancer. So, we had to cut down on sugar drastically, started eating more of alkaline foods. Foods that fight the cancer cells: ginger, garlic; how to prepare the foods properly so you still maintain the nutrients. I am actually an engineer by training, but during her illness I stopped working to take care of her. After she passed away I was just wondering what to do with myself. Then I thought, ‘people are dying or killing themselves by what they put in their bodies and they don’t even know’. So that’s how the idea came about; to just raise the awareness and encourage Nigerians to live healthier. We definitely promote healthy food and drinks. But we also encourage people to live more active lifestyles. So we offer a free boot camp which holds twice a month, though we are planning to hold it every Saturday. Presently, it’s still free. It’s a free workout session with a fitness instructor for an hour. We realize that being healthy also includes mental health – what’s going on in your mind. So we have a book club where we encourage people to read things that feed their minds, spirits, and uplifting, positive things. So it’s healthy mind, body and soul. That’s what we are promoting. Is participation in the boot camp based on membership or is open to anyone? It’s open. Anyone can join. Nigeria’s life expectancy has dropped from 55.2 years in 2018 to 52.2 currently. How’s eating habit contributing to this? I am surprised. The last time I had checked it was about 55 years and now its 52.2? You often hear, somebody slumped somewhere, and he seemed like he was healthy, and he was 40 years old. It has a lot to do with what we eat. We consume so much junk. People are taking a high amount of sugar, chemicals, and a lot of seasonings. Seasonings have an ingredient, MSG, and it’s known to cause cancer. It’s in many of the things we eat. A lot of soft drinks and things, and these cause lifestyle diseases. A lot of people are suffering from diabetes, high cholesterol, high blood pressure, and it’s from their lifestyles, because people are no longer active, they are not burning enough calories and they are still consuming a lot of junk. Also, Nigerian authorities are not paying close attention when regulating what comes into the country. For instance, the Fanta or the Coke you drink here is different from the same products in the UK or USA. They regulate these products, the sugar content, etc., but it’s not so here. We just keep consuming and it’s affecting us. Now, our lifespan is actually shorter. 52 is actually very young and there’s no reason for it because lifestyle diseases are something we have a hand in, that we can control to some degrees. So, we should definitely do something about it. I am very passionate about this. Knowing these about Nigerians, how are you stepping in to change the narrative? Nigerians like to eat. I have realised, for us eating is like entertainment. We are trying to educate people about these things so they are informed consumers. So that way you are aware of what you are buying. You know whether this has gluten or not, or whether this contains MSG or not. So, you are an informed shopper. We are educating people; we are also providing healthier options. So, instead of going to buy that fried chicken, you can get chicken that is baked or grilled without the extra fat. If you are looking to lose weight we provide a sustainable plan that will hold your hand for a while and then you can carry on by yourself. So, you are not just doing yoyo diet – losing weight in an unhealthy manner, putting it back on and letting it affect your body. And then we also encourage people to be more active. We have fitness gears, we provide the free fitness classes for now and if you want to read, we provide the book club that encourages people to read; and not just romance, but books on finances, positive thinking and self helps, just to build their emotional health as well. Like you noted, for Nigerians eating is fun and for many, all these restrictions about what to eat or not seem to dampen the experience. How do you make people enjoy eating this way? We bring in a lot of options. Many people think that eating healthy is to eat salads and green juice. There are a lot more options available in the market. Nigerians like chin-chin; we have low carb chin-chin, chin-chin with coconut flour, with almond flour. Nigerians like to swallow. We now have coconut poundo, coconut fufu, tiger nut swallow, unripe plantain swallow. So that way Nigerians are still eating the things they like but just the healthier versions. There is a vendor that has ugwu, tortilla chips. Instead of that coconut candy, we have baked coconut chips. That way we are still providing fun options that are not just tasty, but also healthier. Eating too much fast food is considered not healthy, but I see some items like fast foods on your menu. Are these different from the conventional fast foods served in other outlets? We don’t have fast foods on our menu. What we have is the skinny shawarma and this has fewer calories than your normal shawarma, it’s more like a salad in a wrap. You can have chicken, egg or tuna. For our eating menu we have Greek Yoghurt bowl. Greek yoghurt is really healthy for you. And it has different toppings which are like super foods, like flaxseeds, pear seeds; you can have fresh fruits and instead of it being sweetened with sugar, you can have dates syrup or honey. We have grilled sandwiches, and instead of using white bread we use whole wheat bread. We use light mayo instead of regular mayo and we have our fresh smoothies and drinks with no sugar or water added; you are just getting the full nutrients of the fruits and vegetables. So I wouldn’t call them fast foods but they are healthy foods that are readily accessible. So, instead of going to the fast foods joints you can come here and get a healthier option quickly, instead of sitting down and waiting at the regular restaurants. You mentioned meal plans among your packages. How do these work? If you are looking to lose, gain or maintain weights in a healthy manner we have different options for you. Customers can come to us, we have complimentary consultation with us and we design something specifically for your needs, your smart goal. Either you can just get the meal plan whereby you prepare the meals yourself or have your cook do it. Or sometimes we provide the meals for you at additional costs. We also offer a kitchen consultation. Because I might say ‘make chicken breast stew and rice’ but the way you prepare your food is different from mine. With the kitchen consultation, we come, go through your pantry, make suggestions on the healthy alternatives of groceries that you should have instead and how to prepare these meals in a healthy manner; that way, you get the best out of the package. Is it possible to actually maintain this kind of lifestyle on a budget, bearing in mind the harsh economic conditions in the country that have forced many to cut down on things to mere necessities? We just did something recently about how to eat healthy on a budget. Eating healthy in the grand scheme of things is not all that expensive. How much is it to buy ugwu or pumpkin leaves or spinach or carrots or apples or vegetables? They are readily affordable. It’s just a matter of you buying them and having these things stocked in your fridge so that that’s what you eat when you want to snack rather than eating biscuits and drinking Coke. If you don’t keep soft drinks or those packet juices in your fridge, you won’t drink them. What people think is expensive is when you go to a restaurant and order salad for N4,000, meanwhile what it costs to prepare that salad at home is a lot cheaper. So I wouldn’t say that eating healthy is expensive, it’s just how you go about it. Another thing I should add is that a lot of our Nigerian foods are naturally healthy. It’s how we prepare them that make what we eat unhealthy. We prepare them with too much seasoning that has unnatural chemicals. We put too much oil, so instead of using regular vegetable oil, you can use coconut oil. Palm oil is actually healthy in small quantities, so reduce the amount of oil. Use actual herbs and spices of seasoning cubes. For many people when you go to their pantry what you see are salt, pepper and seasoning cubes. But there are natural spices like rosemary, thyme, lemon grass, ginger, garlic, coriander; turmeric is really good, and there’s black pepper. So, it’s just a matter of having these natural seasonings readily available and knowing how to use them and for what. From your experience, would you say Nigerians are embracing these healthy habits? From my observation, since we opened the business, Nigerians are becoming more health conscious. When I first moved back, when I went walking or jogging I wouldn’t see anybody on the streets, but now you see people walking, jogging, cycling, rollerblading. Every morning and evening you see people working out. So people are becoming more aware, it’s your health and nobody wants to die early. So, I’d definitely say that healthy lifestyle business is not going anywhere. Nobody wants to die untimely or die badly. You currently base your operations in Abuja. Any plans to expand to other cities in the nearest future? Yes, we do have plans of expanding in the nearest future. Within the next three years we would like to have locations in Lagos, Ibadan, Port Harcourt, and even in the East, like Enugu. We want to position ourselves to be Nigeria’s number one healthy lifestyle brand and eventually, Africa’s. Do you see this becoming the norm rather than the exception in the nearest future? Despite the marked improvement in health consciousness this business is still a niche. Give it 10 years more, or even sooner. We’ve been here for three years and the landscape has changed so much within the short period. So, before 10 years, people will become more aware. Even regular restaurants are offering healthier options, they are offering things for vegetarians, more salads and fresh juices on their menu, and these are the mainstream places. White House "monitoring the bitcoin situation"